Run Boy Run is an exciting young band from Tucson, Arizona, who last year released its first full length CD So Sang the Whippoorwill. The album name is inspired by the Mexican Whippoorwill, a nocturnal "nightjar" bird found in Tucson and the southwestern US. The core of the band is two pairs of siblings. Brother and sister, Matt (fiddle, guitar) and Grace Rolland (cello, vocals), were raised with bow and rosin on every bedside table. 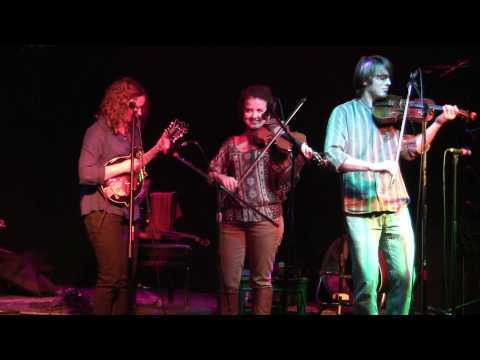 Sisters, Bekah (fiddle, vocals, guitar) and Jen Sandoval (mandolin, vocals), grew up at Bluegrass festivals of Arizona. Jesse Allen (bass) was brought up on opera and western swing and grew to love the natural fusion inherent in American music. All members of the band are songwriters and penned at least one of the original songs on the album. The group exceeds the sum of the parts as touches of classical, jazz, and folk express themselves through the old-time core of Run Boy Run’s sound. There are several young musicians and bands with similar sensibilities, many of them having grown up at Alasdair Fraser’s Valley of the Moon Fiddle Camp, including Crooked Still, Alex Hargreaves, Brittany Haas, Tristan Clarridge. In fact, the instrumental music sounds very similar to Brittany Haas’ first CD. However, where Run Boy Run stands out is singing. They have several strong vocalists and terrific harmonies. Even though I personally like instrumentals, I have to say that Run Boy Run really shines when it comes to vocal numbers. The band has only been in the LA area once, but they will come back in May and play on the main stage at the Topanga Banjo Fiddle Festival, May 18.